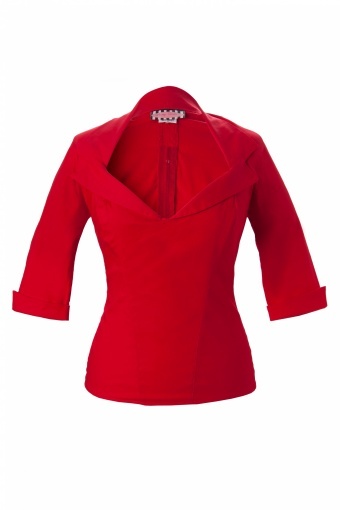 The Doris Top in Red from Pinup Couture - This retro red top with wide collar and half sleeves is the perfect companion to any vintage-style skirt, capri pants, or jeans. It is made of a stretch poplin with a zipper down the back to be form-fitting and body-conscious, it is a must-have separate! Matching pencil skirts, Lindsey wears the Cherry skirt. Made in USA.